Models, features, and advantages of the AO Smith condensing water heaters. Built as the most advanced products, condensing units provide ultra-efficient, high-performing water heating with the significant energy savings. Having problems with these models... check out the troubleshooting guide. This article covers only condensing, gas-powered water heaters from AO Smith that are using tankless technology and are made for the residential and light-commercial water heating, space heating and recirculation. The AO Smith condensing models bring great benefits to the homeowners not only because they are small and lightweight with the compact design, but because they heat water on demand, continually supplying bathrooms and kitchens with very small temperature fluctuation, great accuracy and energy savings due to the ultra-high efficiency. 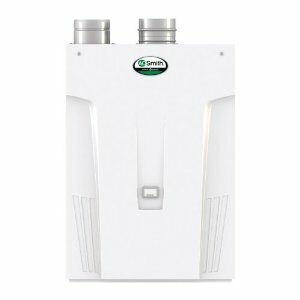 AO Smith condensing water heaters with the tankless technology are designed as an indoor - direct vent and outdoor models, both with the high energy factor of over 0.9, which makes them Energy Star compliant and eligible for rebates and other incentives. Indoor models from ATI series, include a built-in remote controller and diagnostics system for convenient monitoring or adjusting and easier troubleshooting. The outdoor models from ATO series, also include these features but the remote is the wall mount. Direct vent water heaters are designed for indoor installation only, and they come with the power cord as a standard feature and LCD display for showing the temperature and error codes. The maximum hot water flow of 520 series is up to 9 gallons per minute (8 GPM for 320 series) which easily covers homes with up to four bathrooms, while for high demanding homes, water heaters from 520 series can link up to 4 units by using the Easy-Link cable. A modulating gas burner is capable of providing a wide range of heating power, and it goes from 13,000 to 199,000 BTU for 520 series and 180,000 BTU for 320 series, while with the Easy-Link even more. The modulation and water flow are computer controlled so every time the right amount of hot water is produced, at the set temperature and without fluctuation (if possible). AO Smith condensing water heaters are equipped with the two heat exchangers; the main or primary one, made of the commercial-grade copper, which provides better resistance to the thermal and mechanical stress for longer and reliable life, while the secondary heat exchanger is made of the high-quality stainless steel, which prevents corrosion due to the acidic condensation. The secondary HE is used to increase the temperature of the incoming water by "stealing " the heat from the flue gases. Venting pipes are mandatory for indoor models where the maximum length is up to 50 feet and is usually made of PVC, CPVC, ABS or Stainless Steel. The outdoor models do not need a vent pipe since they are venting directly outside by using the electric blower. AO Smith condensing water heaters are computerized and that includes the electronic circuit board which initiates and monitors the electronic ignition, temperature of hot water, water flow, heat power and other parameters, including error code diagnostics and troubleshooting. A remote controller, as the convenient feature, is included in your purchase, and it allows you to change and monitor the temperature and check for potential problems. AO Smith also offers an option to change the water temperature directly on the heater. There are 16 temperature settings to choose from and by using the "increase" and "decrease" buttons found on the computer board you can change the settings. AO Smith condensing water heaters are expensive, but provide great energy savings for its users in the long run. The energy efficiency on all condensing models is over 90%, which reduces the energy loss and makes them eligible for Energy Star approval. They are perfect for larger homes and families where the high hot water demand is needed. With the vent pipe run of over 50 feet and the outdoor installation option, they are the great solution either for the brand-new house or retrofit. All models come with the 12-year warranty on the heat exchangers and five on parts.